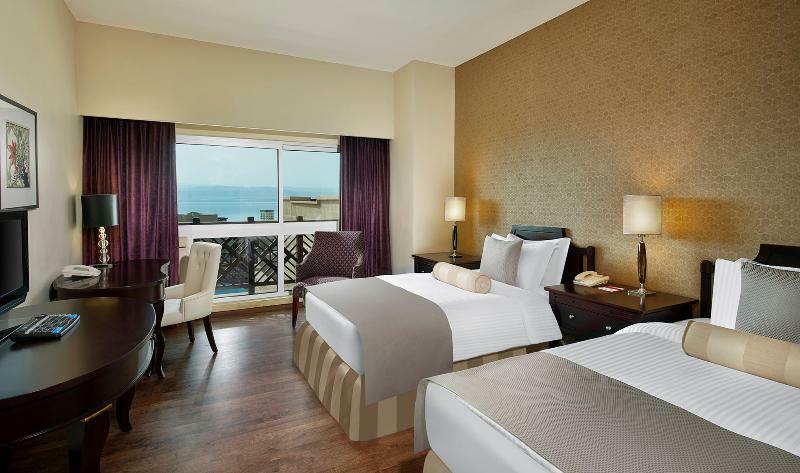 The Crowne Plaza Jordan Dead Sea Resort & Spa offers 420 guestrooms and suites beautifully appointed and furnished to meet the highest standards, providing superior luxury and exclusive services. Awaken each day feeling revitalized with the comfortable therapeutic mattress and fluffy pillows dedicated to delight the senses of every staying guest.If you are looking to host a business meeting or a conference that is exceptional then you are at the perfect venue with 1200 m2 of meeting and banqueting facilities including our grand ballroom accommodating up to 2000 delegates reception style and two boardrooms fully equipped with the ultimate in technology that will turn your event into a momentous one. Travellers are welcomed at the hotel, which has a total of 420 rooms. The individual storeys can easily be reached via the lift or stairs. Amenities include a safe. Wireless internet access in public areas allows guests to stay connected. Among the culinary options available at the establishment are a restaurant, a dining area and a bar. Travellers can buy souvenirs at the gift shop. Children can have a great time playing in the playground. Additional facilities at the accommodation include a playroom. Guests arriving by car can leave their vehicles in the garage or in the car park. Available services and facilities include a babysitting service, a childcare service, room service and a laundry service. Each of the rooms is appointed with air conditioning, a kitchen and a bathroom. The basic features of most rooms include a balcony. Many rooms feature a sea view, which further enhances the ambience. Cots are available for younger travellers. A safe, a minibar and a desk are also available. A fridge, a mini fridge and a tea/coffee station ensure a comfortable stay. An ironing set is also available for guests' convenience. Other features include internet access, a telephone, a TV and WiFi. The bathroom offers convenient facilities including a bathtub. A hairdryer and bathrobes are provided for everyday use. The hotel offers non-smoking rooms and smoking rooms. Catering options available at the hotel include half board and full board. Guests can choose to book options such as breakfast or dinner. A refreshing dip in the indoor or outdoor pool is an enjoyable way to cool down on hot days. Sun loungers on the sun terrace offer an inviting place to relax. Those wishing to enjoy sports whilst on holiday can enjoy on-site beach volleyball. For a fee, tennis is is also available. Sport and leisure facilities at the establishment include a gym and darts. The accommodation offers a range of services in the wellness area, such as a spa, a sauna, a steam bath and massage treatments, and for an additional fee, a beauty salon. Additional services include an entertainment programme for children, offering numerous activities. The best service in Jordan ever ! First Class Every Step of the Way! Want to stay at Crowne Plaza Jordan - Dead Sea Resort & Spa? Rehlat.com helps you find your perfect hotel room or suite accommodation in Crowne Plaza Jordan - Dead Sea Resort & Spa. With our fast online search facility you can view detailed hotel description, photos, and testimonials and securely book your hotel room online.We would be glad to help you in Crowne Plaza Jordan - Dead Sea Resort & Spa booking. The hotel offers value-for-money accommodation in the heart of City’s commercial district, perfectly surrounded in the area of business, culture, and tourism. The compact but functional rooms are complemented by all the modern amenities needed to ensure a relaxing and comfortable stay. Get your Crowne Plaza Jordan - Dead Sea Resort & Spa booking done on Rehlat and avail huge discounts and best last minute deals on hotel reservation costs. The booking gateway of Rehlat is simple, easy, and safe and has secure localized payment options like Sadad, CashU, KNET, and Master/Visa cards to make sure that you get a hassle-free, personalized and safe experience.Corporate travelers with Crowne Plaza Jordan - Dead Sea Resort & Spa booking can be rest assured that their stay will be comfortable while leisure travelers can make use of the concierge's vast local knowledge before preparing their itinerary. After a long day out, clients can relax and enjoy the personalized service by the expert staff at the comfort of their modern state-of-the-art rooms.Reserved your stay at Crowne Plaza Jordan - Dead Sea Resort & Spa and now want to change the date or have some other question? No worries! Call Rehlat’s multilingual customer support (English & Arabic) and get your every query and concerns answered and addressed.Also know the key amenities of Crowne Plaza Jordan - Dead Sea Resort & Spa along with the policies for the hotel at one place. Happy Staying at Crowne Plaza Jordan - Dead Sea Resort & Spa!